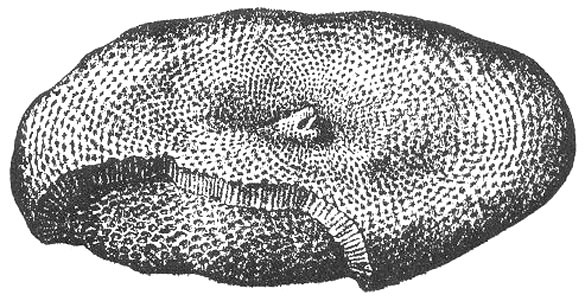 Below is a nineteenth century illustration of a typical receptaculitid fossil. They are sometimes called “sunflower corals” because they look a bit like the swirl of seeds in the center of a sunflower. They were certainly not corals, though, or probably any other kind of animal. Receptaculitids appeared in the Ordovician and went extinct in the Permian, so they were confined to the Paleozoic Era. Receptaculitids were bag-like in form with the outside made of mineralized pillars (meroms) with square or diamond-shaped heads. 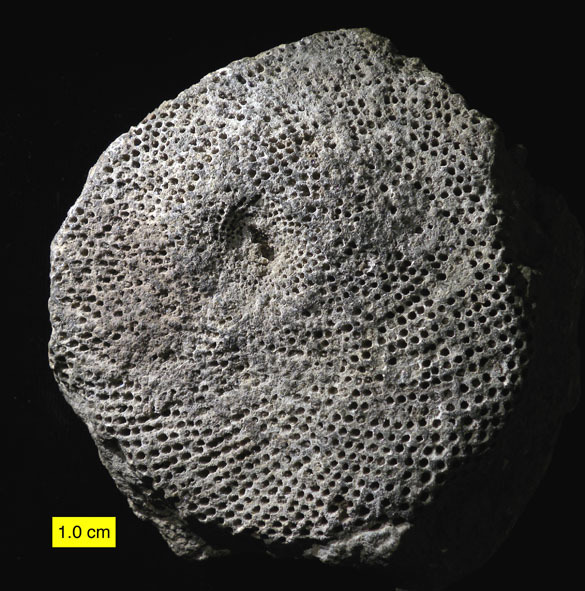 The fossils are usually flattened disks because they were compressed by burial. You may notice now that the fossil at the top of this post is a mold of the original with the dissolved pillars represented by open holes. (Paleontologists can argue if this is an external or internal mold.) So what were the receptaculitids? 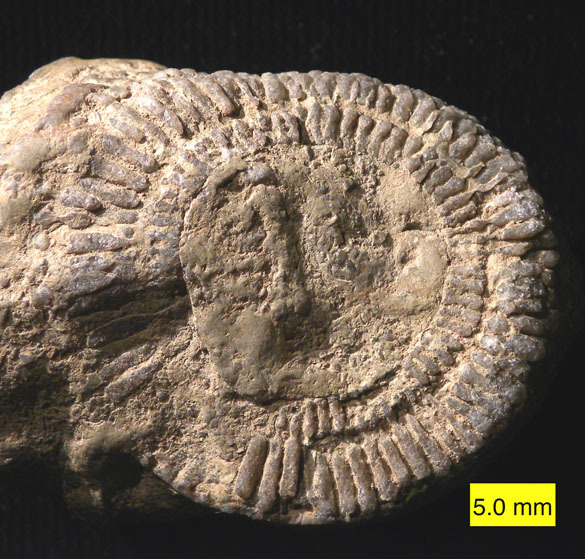 When I was a student we called them a kind of sponge, something like a successor of the Cambrian archaeocyathids. In the 1980s a convincing case was made that they were instead a kind of alga of the Dasycladales. Now the most popular answer is that they belong to that fascinating group “Problematica”, meaning we have no idea what they were! (Nitecki et al., 1999). It’s those odd meroms that are the problem — they appear in no other known group, fossil or recent. I find it deeply comforting that we still have plenty of fossils in the Problematica. We will always have mysteries to puzzle over. Another Wooster receptaculitid specimen, this time seen from the underside showing side-views of the meroms. 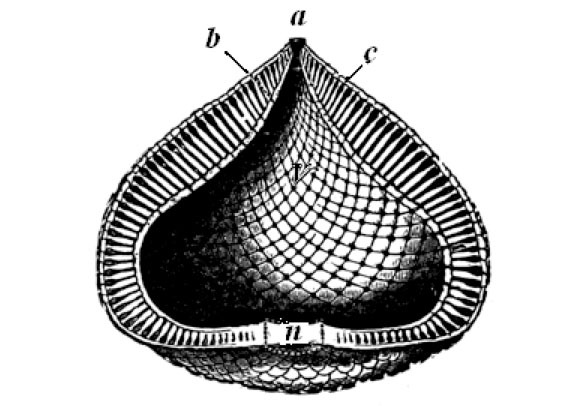 Diagram of a receptaculitid in roughly life position showing its inflated nature and pillar-like meroms. From Dawson (1880, fig. 25): a, Aperture (probably imaginary here). b, Inner wall. c, Outer wall. n, Nucleus, or primary chamber. v, Internal cavity. 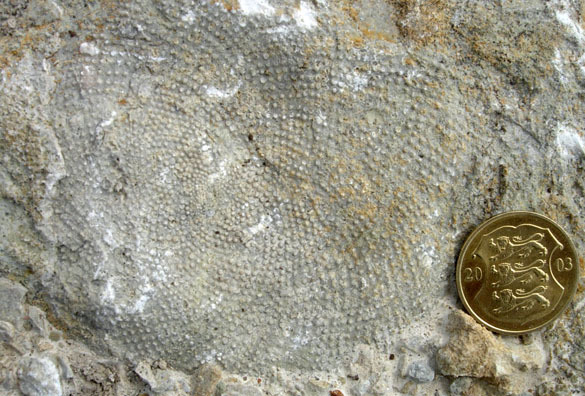 Finally, this is what a typical receptaculitid looks like in the field (Ordovician of Estonia). Note that nice sunflower spiral of the merom ends. Dawson, J.W. 1880. The chain of life in geological time: A sketch of the origin and succession of animals and plants. The Religious Tract Society, 272 pages. Nitecki, M.H., Mutvei, H. and Nitecki, D.V. 1999. Receptaculitids: A Phylogenetic Debate on a Problematic Fossil Taxon. Kluwer Academic/Plenum, 241 pages.